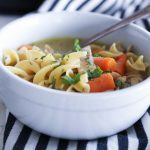 Instant Pot Chicken Noodle Soup is warm and comforting, and filled with hearty chicken, loads of noodles, and chunky veggies. Best of all, it’s homemade and takes fraction of the time of Classic homemade Chicken Noodle Soup. Perfect for dinner anytime of the year! Chicken Noodle Soup is one of those dishes that soothes the soul. After a long day, it’s SO nice just to cozy up with a bowl of steaming homemade soup. There’s something therapeutic about it. 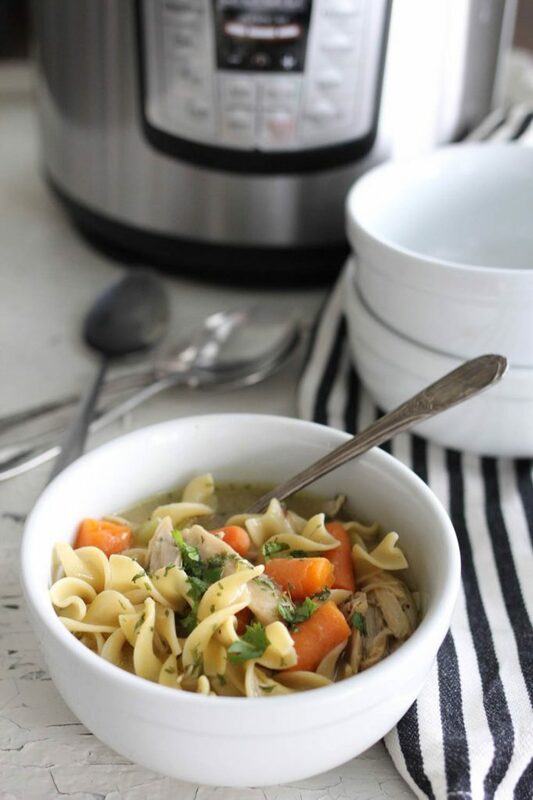 With just a few simple ingredients, this Instant Pot Chicken Noodle Soup can be on the table in minutes. As with most Instant Pot recipes, most of the time is waiting for the food to pressurize! All you need are chicken thighs (or breasts if you prefer but not as flavorful), a few veggies, chicken broth, salt, pepper, and water. And an Instant Pot. Trust me, this will be your new go-to soup recipe all cold-weather season long! If you’re lucky (today!) the Instant Pot is on sale. I just checked and the price today is under $80 shipped if you have Amazon Prime! This Instant Pot is my go-to recommendation if you have 2 people or even 10 in your family. I love my 8 quart model, but for day-in-day-out, I like my 6 quart. It’s a little easier to maneuver in the kitchen and can cook meals for up to about 12 people. There’s nothing like the homemade stovetop chicken noodle soup that mom used to make. But this Instant Pot Chicken Noodle Soup comes pretty close. It takes a fraction of the time but still has ALL the flavor you love and crave. If you haven’t used chicken thighs before, give them a try in this recipe. They add a delicious savory flavor to the soup and turn out perfectly tender. Let them simmer in the chicken broth with some chunky veggies and oodles of noodles, and that’s it! Easiest meal ever. The changing fall colors, the chill in the air, and warm evenings sitting by the fire. Soup season is the best season. It’s one of my favorite ways to cozy up on a chilly day and ease a case of the flu. The smell of the simmering broth itself will have your family wandering into the kitchen. And with the Instant Pot, this Chicken Noodle Soup will taste like it’s been cooking all day. It’s a simple one-pot meal, packed with comforting flavors that are sure to satisfy your family’s appetite! I mean, seriously. Is there a person on the planet who doesn’t love a bowl of homemade chicken noodle soup? If you’re looking for a quick and easy meal to make this fall season, you need this recipe. Instant Pot Chicken Noodle Soup can be on the table about 40 minutes, and tastes like it’s been cooking for hours. With colder weather here, not to mention the sniffles and runny noses, there’s nothing more comforting than a big bowl of homemade soup. And trust me, this soup is about as easy as it gets. Happy fall my friends! 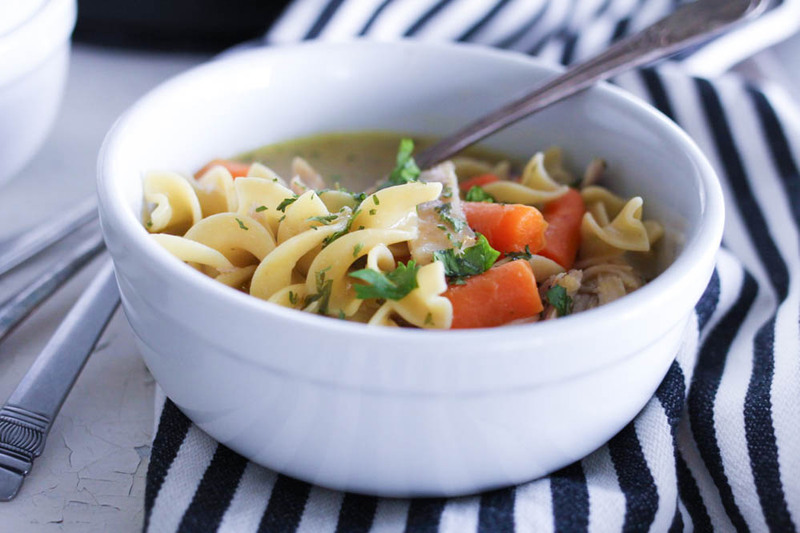 Nothing is easier than Classic Chicken Noodle Soup in the Instant Pot! 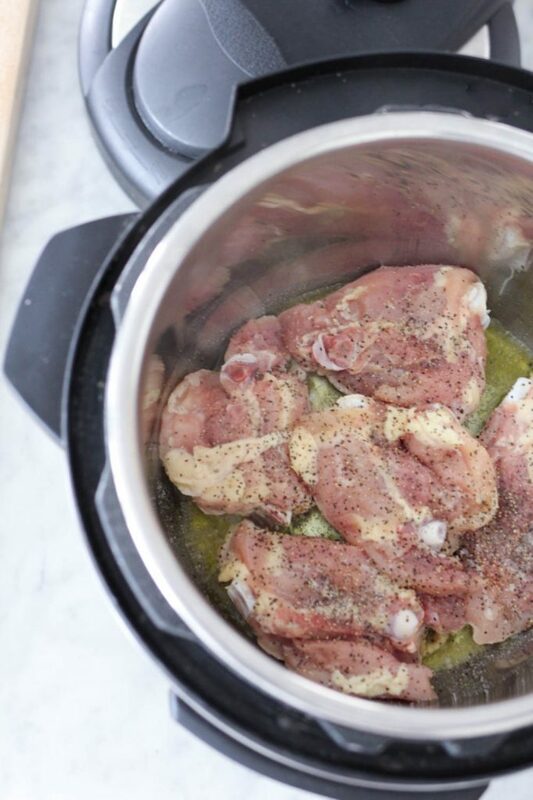 Using the Instant Pot cuts the cooking time of the chicken in half while tenderizing the meat so it falls off the bone. Turn Instant Pot to SAUTE setting. When pot is heated up, or after about 4-5 minutes, add 2 tablespoons olive oil or butter to pot. Season the chicken generously with salt and pepper on both sides. Carefully place chicken thighs in the pre-heated Instant Pot. Cook for 3 minutes and then carefully turn the chicken over. Cook for an additional 3 minutes and sprinkle with dried thyme. 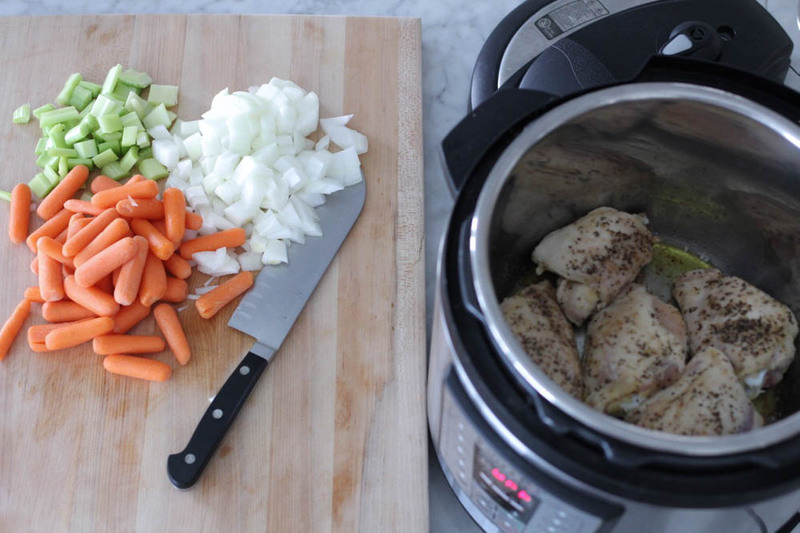 Remove chicken from the Instant Pot and add chopped carrots, celery and onion to the pot (there will be residual oil and seasonings in the bottom of the pot. Do not wash or wipe out. Sauté the vegetables for 2 minutes (just long enough to coat with drippings and begin to brown a bit). Add 2 cups cold water, chopped garlic, 1 teaspoon salt, 1 teaspoon pepper and browned chicken back into the Instant Pot. Set Instant Pot to the MANUAL or PRESSURE COOK or HIGH PRESSURE setting, placing timer to 6 minutes. Make sure the plastic seal is in place inside of the lid before placing lid on the Instant Pot and the valve on top of the lid is set to the SEALING position. After the timer goes off, carefully release the steam from the Instant Pot using the VENTING position on the lid. Remove the chicken from the Instant Pot and set on plate or cutting board. Add 4 cups chicken broth plus 2 additional cups of water to the Instant Pot. Change the setting to the SAUTE setting and bring the contents of the pot to a boil. Add 8 oz pasta to the pot and cook according to package directions. While the pasta is cooking, shred or chop the chicken and discard any bones and skin remaining. After pasta is cooked, add chopped chicken and two packages homestyle chicken stock* (or chicken bullion or other chicken flavoring) to the soup to taste. Season to taste with salt and pepper. Top with fresh or dried parsley. If you like creamy chicken noodle soup, add about 2 tablespoons cornstarch to 1/2 cup of water and mix until smooth. Add to the finished soup while broth is hot. Stir well. I like to add sautéed mushrooms to this soup as well. I sauté the mushroom in butter in a separate pan and add at the very end just before serving. If using bagged baby carrots, no need to chop the carrots, I just put them in whole. If the soup seems a little skimpy on the broth, simply add a bit more chicken broth. I like to use Knorr brand "Homestyle Chicken Stock" which is sold in little mini tubs (4 to a package) or the "Better than Bullion" brand stock concentrate. This sounds wonderful! If I don’t have an instant pot, will this recipe still work? Thank you, LOVE all your recipes! If you don’t have an Instant Pot, use my slow cooker version, or just cook the chicken until done and then add the vegetables and cook until tender, adding noodles last. Thanks for reading ABK! This is a great recipe! Our family enjoyed every bite. I added cilantro at the end instead of parsley. I think it would be delicious either way. Yum! This soup sounds amazing! I love your instant pot recipes. Did you use bone less chicken thighs or bone-in? Thank you for your great recipes. I used bone in chicken thighs! I have also used chicken breasts, boneless, skinless, but the flavor is much better with thighs. How much “Better than Bullion” would you use if not using the Knorr packages? Thanks! I would use two tablespoons. Let us know how this works for you! I would add if I were you for the sauté or chicken if you put the lid on or not for the 3 minutes per side. Mine took way longer and therefore dinner was done a lot longer and frustrating for my husband and I. If you don’t use the Knorr packets, how much Better than Bullion would you use? Hi Joanna, it depends on how much chicken flavor you want in the broth. I would use 3 to 4 teaspoons. Hope this helps and thanks for asking! It’s so perfect for this time of year, and a great meal to share. Thanks for your comment, Alisa! Loved it but I had a hard time getting a boil on Sauté mode. Any suggestions? Lid on? I played around with boil on yogurt mode and beef/stew mode but never really got a boil. Hmm I haven’t run into that issue before, Laura. Maybe let it sit on sauté mode for a little longer, or just add less chicken broth at first and see if it boils. Hope this helps and thanks for asking! This soup had FANTASTIC flavor!! I even completely left out the stock recommended at the very end. My only issue was the vegetables getting too mushy, so I removed them from the IP before boiling the pasta. I have two kids with the flu right now and this was the perfect soup to bring them comfort and soothe their throats. My husband is keto so I just cooked the noodles separately on the stove. It’s delicious with and without the noodles! He claims it is the best chicken noodle soup I’ve ever made. 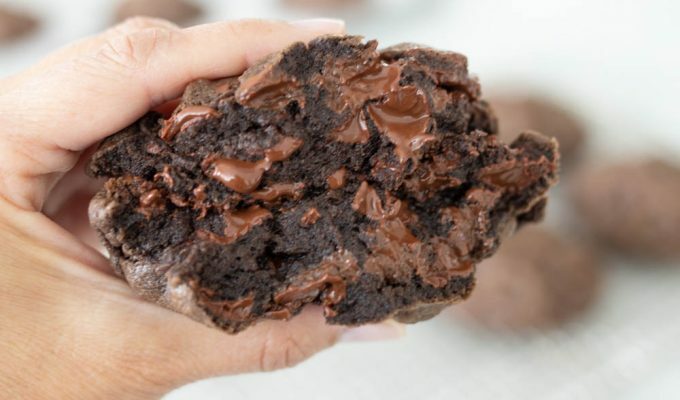 Thank you for sharing all your delicious recipes.